Stop #1 for Winter Restaurant Week 2012! I’ve been to Grotto once a couple of years ago and remember having an incredible bolognese, so I knew this place made great Italian food. After looking at their RW menu offerings I immediately made a reservation. It was time I return! 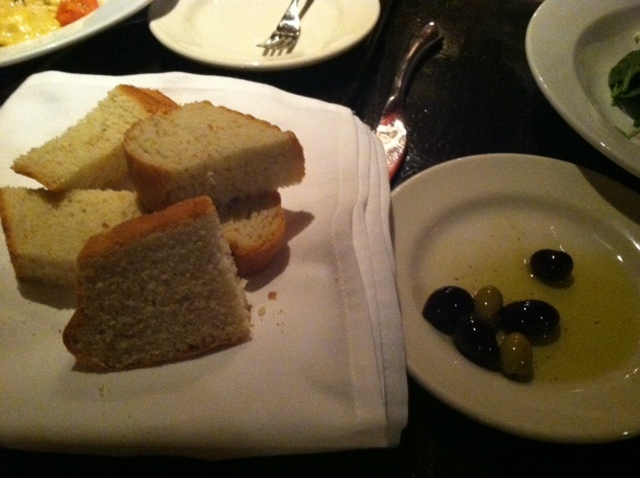 Bread: About 6 slices of soft white bread was served with a side dish of EVOO and olives. This almost had the consistency of potato bread, which I’m not complaining about! We could have used a little more EVOO, or perhaps some parmesan to sprinkle on top? Menu: Most Restaurant Week menus are limited, but not Grotto’s! There were 9 Primi options, 9 Secondi choices, and 4 Dolce offerings. I had to study the menu for days in order to mentally prepare myself. As I had already tried their Bolognese years ago, I ended up going with my selections below (but of course tried a bite of everyone else’s dishes!). Served in a wide bowl, this soup was not a puree nor was it exactly broth based. It didn’t contain cream, but had a liquid-y creamy texture. 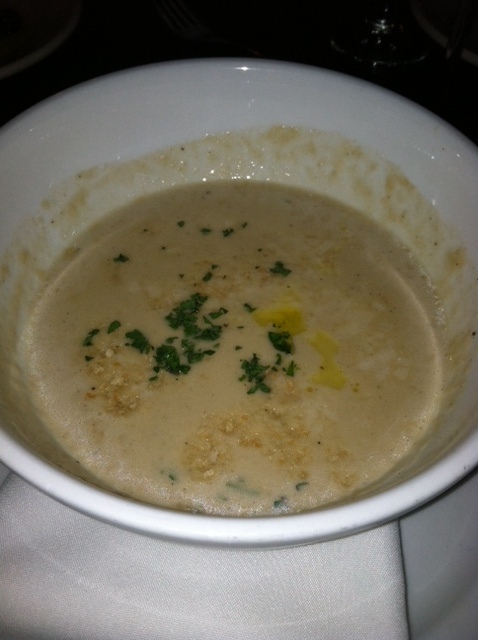 Really flavorful and not too filling which was perfect … I just adore soup! 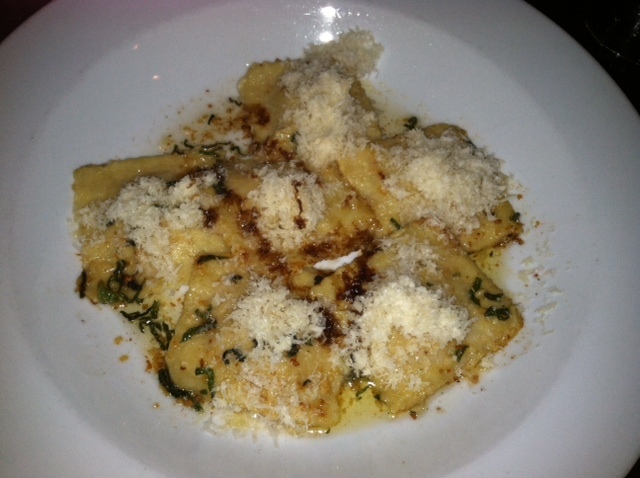 Six ravioli were served, each topped with a tiny mound of shaved parmesan. When I ordered this entree I mistakenly said “butternut squash ravioli”, as I usually think of these 2 veggies as one in the same. I clearly have not had sweet potato ravs in quite some time; this was the sweetest pasta dish I’ve ever tasted. Rich and full of different flavors, I really enjoyed it! 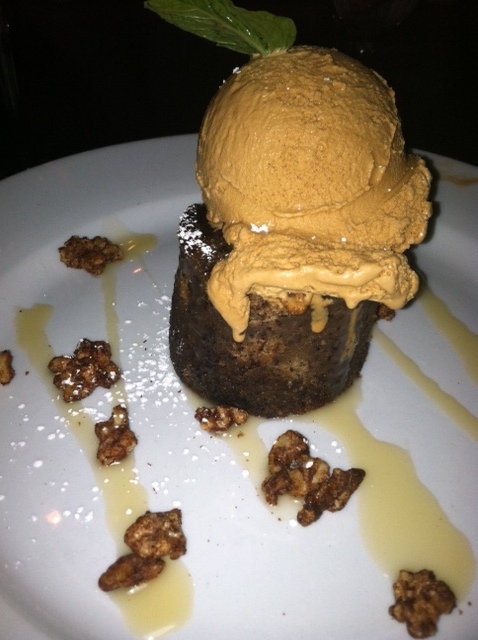 The bread pudding was topped with a giant scoop of creamy caramel ice cream, and surrounded by a scattering of spiced walnuts. This was unbelievable, but after cleaning the plates of my first 2 courses I regrettably couldn’t finish this one. The bread pudding was moist and delicious; I should have at least taken that part home! Grotto itself is a small underground restaurant, and the bathroom reflects that. 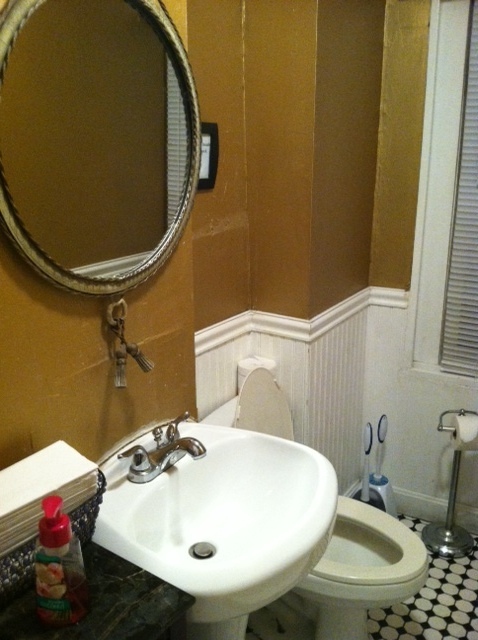 Located in the back past the kitchen, this one room unisex restroom didn’t have many unique or warm characteristics. I did like the fruity smelling soap though! Service: Our server was nice and able to answer our menu questions. Our water glasses were constantly being refilled, which as a ‘conscious hydrator’ I always appreciate. We were seated for a good 2 hours, which I thought was a bit long, but sometimes it’s nice to take time in between each course. Overall: Grotto is a small cozy establishment, seating only about 44 people (and up to 55 for private parties). Whether it’s Restaurant Week or a regular Tuesday, I highly suggest you try Grotto for an excellent hearty Italian meal. All of their Primi, Secondi, and Dolces on the regular menu are the same price ($10, $21, and $9 respectively) and they also offer a daily prix-fixe dinner menu for $36. The Perfect Bite: Each of the three courses I ordered was fantastic! If I have to choose… I’ll go with the Garlic Soup. It was light, delicious, and quite flavorful. This entry was posted in Beacon Hill by Dena Raffa. Bookmark the permalink.